Well, I have a lot of it. Lots of different pots and such for different uses. I’ll go from the “top” row (the one containing the French press) from left to right, then the bottom row, left to right. The first two objects are gaiwans. They’re a traditional tea-device used in China (and surrounding areas, I’m sure) for both brewing tea and drinking tea from. The first one I miraculously found at a thrift store, the second I got at that amazing tea shop in Montreal that I’ve talked about. Next is my heavy-duty steel French press. I broke three glass French presses, so decided to give up the nicencess of having a glass body for something that would last longer. Next is my small clay teapot. This is another traditional tea device used in China, especially in the Gung-Fu practice of making tea. I also found this at a thrift store, which I was thrilled about, since I’ve wanted one for a long time. Next is… I’m not sure what. It may be a gaiwan, but I don’t know. My friend gave it to me, since he didn’t know what it was either and didn’t have a use for it. 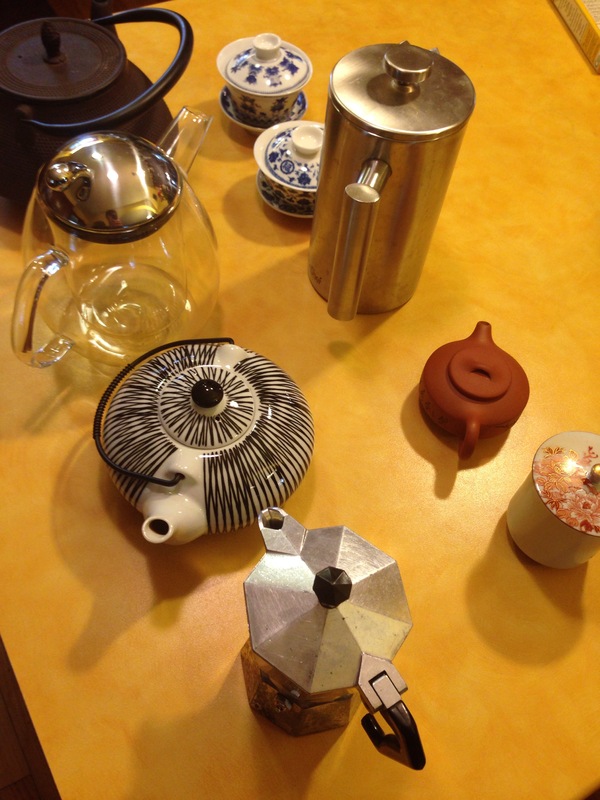 Next (starting on the bottom row) is my trusty Tetsubin, a cast iron and clay teapot widely used in Japan. I make a lot of my puer in this, and it stays warm for a long time, which is very useful. Next is an insulated glass teapot, which I got at that same thrift store as before. I use it quite a bit at work, and often keep it there. Thankfully, a French press plunger/strainer fits perfectly in it. And finally, my Moka Pot espresso maker. I also have a larger model of it, but I don’t think it’s in working order. Not for tea, really, but I figured I’d put it in here anyway. 25 Sep	This entry was published on September 25, 2015 at 5:39 pm. It’s filed under Drink, Japanese, Tea, Uncategorized and tagged andrew vochman, drink, equipment, food, introduction of heat, tea. Bookmark the permalink. Follow any comments here with the RSS feed for this post.